Buy Legit Klonopin Almost a year after the release of volume one, Keith Worthy finally saw fit to bless us with volume two of his Moments in Rhythm series. It was worth the wait. 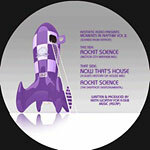 “Rockit Science (K-Dub’s Motor City Mayhem Mix)” begins with synthesizer swirls over a steady metronome tap. A reverberating, square bassline drops in a good octave above the norm, reminding me of Convextion in full electro mode. Just when you think the groove can’t get any stronger, synths go a bit haywire and deeper pulses hum. Lush strings remind me how Detroit inspired an entire generation of music makers. Order Xanax To Canada The B-side is just as good. “Now That’s House (K-Dub’s History of House Mix)” actually reminds me of early Speedy J. Layers of electronic squiggles build over a bed of crisp snares. On “Rockit Science (The Deeptroit Deepstrumental),” sliding B-movie treble leads into warm Detroit chords and deep, roving bass. Eventually, a rattling beat and soft, low, bell-like tones provide comforting embrace. It’s a welcoming future. Order 3Mg Xanax Online J.